We are proud to announce our partnership with The Royal British Legion on this centenary year of the Armistice with the launch of a limited edition scented sachet. 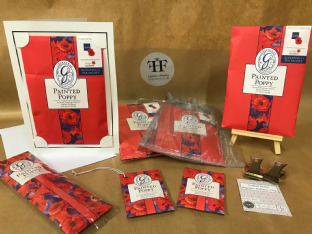 The Autumn / Winter season we are looking to raise £36,500 for the Legion by selling 36,500 Greenleaf Painted Poppy large Scented Sachets. This target represents every single day that has passed since the end of the Great War on 11 November 1918.